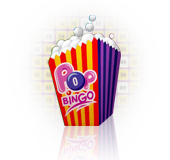 Pop Bingo is a nifty little arcade game one can play in every bingo room or arcade game website which decides to feature it. The cool thing about it is that you do not even have to have any money to play it: you can give it a test-run for free. The other appealing thing about the game is that it seems to let the player win the majority of the time. There are rules to the game, but you can play it just as well, even if you do not understand anything. Players can set the amount they want to wager on every card, and they can choose a new card any time they want to. Obviously, the more one bets, the more he stands to win. 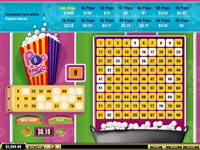 All one needs to do is to select a new card, to set the amount of the bet and to click the "Play" button, which sets things into motion.The rules of the game are simple: there's a bowl of corn in the bottom right area of the screen which begins popping as you hit Play. As the corn pops, it his certain numbers on the table above it. As the numbers featured on our card are hit, they get marked. If you manage to daub the entire selection on your card in fewer than 40 pops, you take down the maximum prize, which – depending on how much you bet – can be quite breath-taking indeed. There are 90 pops altogether, and if you fail to fill out your entire card by the 89th pop, you lose. In-between, the prizes are gradually decreasing. As a general idea: the fewer pops it takes you to fill out your card, the more you win. While play money action is fun as well, the real deal is when you really have something to root for.